Are you looking for a professional that offers hardwood floor cleaning and refinishing services? As a trusted wood floor cleaning service, we have helped hundreds of homes and businesses restore their wood floors to a “like new” finish and we can do the same for you! We use a quick and painless sand-less hardwood floor refinishing process that is able to restore the look and feel of your hardwood floors without the hassle of traditional sanding. Sand-less hardwood floor refinishing is a modern technique that offers the same benefits of traditional refinishing without any of the disadvantages. With conventional hardwood floor refinishing, the job can take anywhere from days to multiple weeks to finish. Not only that, but many times the homeowner is required to stay out of the area until the process is finished. With sand-less wood floor refinishing, on the other hand, the process will take much less time. While the results are the same as far as quality, look and feel of traditional refinishing, the dustless sand-less process prevents heavy debris while shortening the timeline for completion. With sand-less hardwood floor refinishing, on the other hand, the process is much less time-consuming. While it results in the same quality look and feel of traditional refinishing, the dustless sanding process prevents heavy debris while shortening the timeline for completion. Is Wood Floor Refinishing an Alternative to Replacement? In the majority of cases, yes. Over time, the wear and tear on your hardwood floors can cause them to become scuffed, scratched, and worn down. And while you may feel like it’s time to get your wood floors replaced, wood floor cleaning or refinishing is a much more affordable (and often just as effective) option. The only way to know for sure whether hardwood floor refinishing is the best option for your needs is to consult a professional. To do that, you can either call us directly or fill out the short form on our website, and we’d be happy to set up a time to discuss your options in more detail. How Often Should You Have Your Wood Floors Refinished? Most experts recommend that you have your wood floors refinished every 5-7 years. Doing so will extend the life of your wood floors and ensure that they last for several decades. 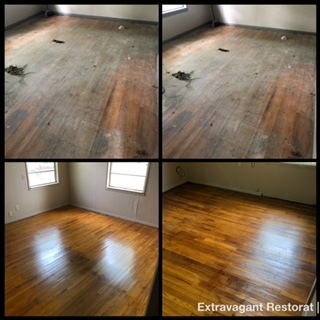 If you want to find out more about how we can help with your hardwood floor refinishing needs, we at Extravagant Restorations encourage you to get in touch. Just fill out the short form on our website, or call us directly, and we will be happy to help. We look forward to working with you!